Ryan, Murphy, Maguire, Paisley, Rogers; Fahey, Keane [Murphy 86], Gibson (Brennan 75), Kirby; Barker, Quigley. Kelly, Sullivan, Brennan, Ryan, Prunty; Duffy (Reilly 66), Deegan, Doyle (Martin 59), Rutherford (Wexler 90); Mooney, Freeman. 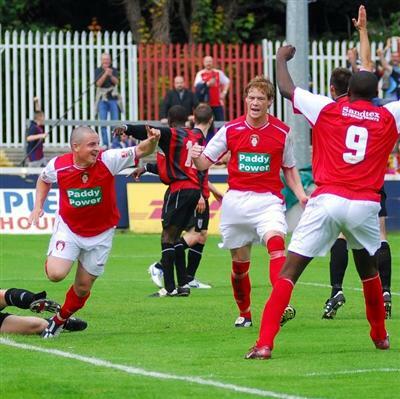 CHANGING times at Inchicore. The Garrett Kelleher-led takeover has certainly transformed the Saints off the park and they are beginning to look a different proposition on the pitch as well. The jury is out, however, on whether the latter is a good thing. While they had enough to see off the challenge of relegation certainties Longford at Richmond Park yesterday, there is a marked contrast between John McDonnell's side now and the one which started the season. Gone, for now, is the 3-5-2 system which thrilled in the early weeks of the campaign as the three man central midfield of Keith Fahey, Joseph Ndo and Alan Kirby played with a freedom which is unusual to this league. That seemed a distant memory during this encounter as the hosts fielded a traditional 4-4-2 with recent additions Billy Gibson and Michael Keane beefing up the engine room and Keith Barker filling the role of old fashioned big man up front. With Ndo injured, flair players Kirby and Fahey have been deployed to either wing thus offering only fleeting glimpses of their ability. Essentially, it was a team that was out there to get the job done, although they suffered a few jittery moments in the latter stages against the Midlanders. With the alternative attraction at Croke Park, the sparse crowd gave muted feeling to proceedings and it wasn't particularly pretty in the first half. Therefore, it was probably fitting that the only goal before the interval was of the scrappy nature with Michael Keane opening his account for Pat's by scrambling home a Dave Rogers cross. Certainly, the hosts were well in control but their dominance was accentuated by the inability of Longford to make inroads when they attempted to make forays into opposition territory. After the break, carelessness from the Midlanders saw them fall two behind. A needless concession in midfield by Daire Doyle instigated a passage of play which culminated with Anto Murphy heading home Fahey's corner. 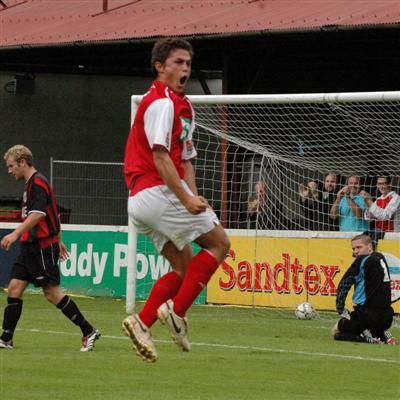 Dave Mooney pulled one back for the visitors in the 70th minute after a Barry Ryan error but shortly afterwards the two goal gap was restored when Fahey's wizardry released sub Ryan Guy who powered home his first goal in Pat's colours. Pat Sullivan's expertly taken 82nd minute free kick provided further hope for Longford but the Saints wrapped up the three points courtesy of a slightly fortuitous Kirby strike in time added on. Table-toppers Drogheda remain in their sights, but the Dubliners will need to be considerably better than this when Odense come to town on Thursday.